Are Remy Lace Wigs The Only Option? "Are remy lace wigs the only option or are there non-remy wigs?" You may have seen other sites for lace wigs that all talk about remy lace wigs with banners that scream; “100% remy”, “100 Indian remy” or “100% Chinese remy” but very few actually explain what remy hair is, why it should be an option and the difference between remy and Non-remy human hair. The short answer is that remy hair wigs are not the only option; non-remy hair wigs (hairpieces, extensions and so on) are also options. Non-remy hair is regularly used and widely available... and below we go deep.... cuticle layer deep to outline the differences between remy and non-remy hair. The type of human hair used in your wig will determine its quality and lifespan. You’ve probably figured out that remy only relates to human hair, so if you’re into synthetic hair, you can still read on to know for yourself what all the noise is about, all the while knowing that it doesn't impact synthetic lace wigs. So let’s get to it, when talking about full lace wigs, lace frontals or lace front wigs, what does remy hair actually mean? In order to answer that question, a few points have to be made about hair. Hair grows out of your head and the ends are called tips and the hair closest to your scalp are roots. The most significant fact to remember is that every single strand of hair points in the same direction – your roots are on your head and your tips are at the ends. The layer of healthy hair we all see, is called the cuticle layer. This cuticle layer looks smooth to the naked eye but when examined under a microscope individual hair strands resemble a tiled roof (or for our friends across the water, shingles). So what do we have? 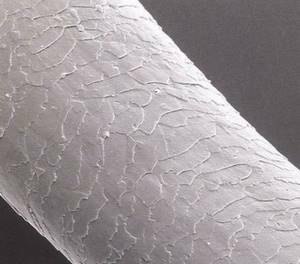 Scaly strands of hair that all point in the same direction (roots one end, tips the other). So what does that mean? The scaly cuticle layer of each strand is less likely to catch on the scaly cuticle layer of another strand and therefore become tangled. Hair with cuticle layers which all face the same direction is classified as remy hair; even if it's been chemically processed for colour, hair texture or both. Non-remy hair might not have cuticles which means you'll have to use styling products (probably with silicone) to smooth out the hair and make it look shiny; and you'll have to face the fact that the dyed colour will fade more quickly than usual because the cuticles aren't present. Non-remy hair might have its cuticles but they point in different directions (root to tip and tip to root) which means you'll need to use styling products (probably with silicone) to smooth out the hair and the hair tangles more easily as the cuticles on strand pointing upwards catches on the cuticles of another strand pointing downwards. – all strands have cuticles which point in the same direction - this means remy hair tangles in the same way that natural growth hair normally tangles. Basically this means that remy hair lace wigs can last longer than non-remy lace wigs but it doesn't mean that they will; as it also depends on how you care for and maintain your remy hair lace wig. It also doesn't mean that remy lace wigs will never tangle - all hair tangles, that's a fact of life. If normal growth hair didn't tangle why would there be detangling combs and detangling brushes for growth hair? – strands point up and down – or strands don't have cuticles - this means non-remy hair has the potential to tangle more than natural growth hair normally tangles. Essentially this means that non-remy hair lace wigs may not last as long as remy lace wigs, but it doesn't mean that they won't; as this can also depend on how you care for and maintain your non-remy hair lace wig. It also doesn't mean that non-remy lace wigs will always end up severely tangled - as this depends on the type of non-remy hair; if it doesn't have cuticles then they can't catch on each other and cause tangling. That's a wrap on remy hair wigs. Here at Peruke, our listings only state that the hair is 100% remy if our suppliers have checked the (100% remy hair) box to say that it is. So if you're after remy lace wigs, check the listing description for conformation of the type of hair used and you can check out an article about whether non-remy hair wigs are a viable option. There are lots of questions about lace wigs, so why not check out the Your Lace Wig Questions, Answered section or to find out about new articles and guides about hair extensions, wigs and hairpieces join our blog.